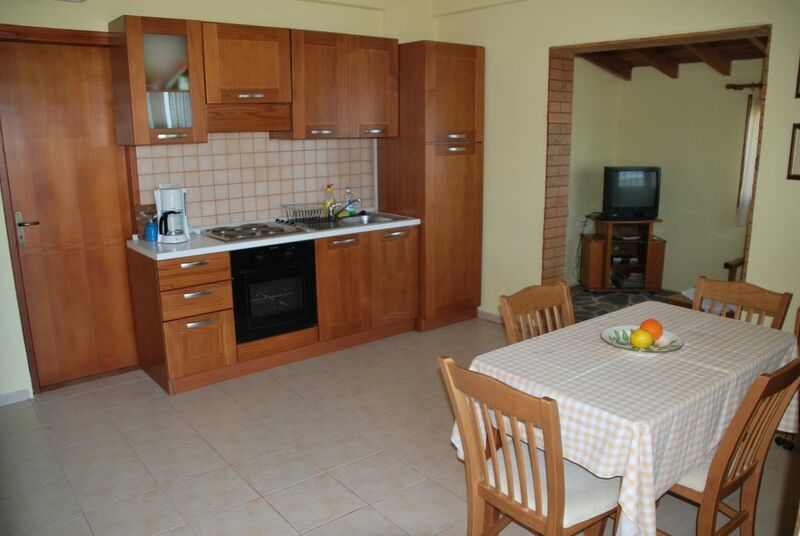 The 2 bedroom house has a double bed and two single beds and a fully furnished kitchen that seats four. The second bedroom has a separate entrance. A crib is available for younger children. The shaded front porch offers you the perfect place to enjoy the fantastic views of the surrounding landscape. You will enjoy watching the sunrise and sunset, causing beautiful reds and purples to colour the cliffs on the opposite side of the bay. Fresh air and sea breezes, and perhaps a walk in the hills, will open your appetite for a dinner of fresh fish at one of the tavernas in the village. The fish is caught that morning by local fishermen and is some of the best in Greece due to the clean waters. If you are an early riser, you may even see your dinner arriving! Special celebrations take place in the village at Easter time and you are welcome to join in. The villagers are very friendly and the village offers much hospitality all year round. In the fall, olives are harvested and oil is made. Vaia Villa’s houses and apartments are surrounded with flowers, herbs, and natural beauty, and located in a peaceful, clean area with private parking. With a coffee or beer on the shaded front porches, you will enjoy watching the sunrise and sunset, the beautiful reds and purples colouring the cliffs on the opposite side of the bay. Fresh air and sea breezes, and perhaps a walk in the hills, will awaken your appetite for a dinner of fresh fish and locally grown vegetables at one of the village tavernas. Some of the best fish in Greece is caught by local fishermen. If you are an early riser, you may even see your dinner arriving! Several beaches, some pebble and some sand, offer places to swim or relax near the village. Special celebrations take place in the village at Easter time and you are welcome to join in. The people are very friendly and the village offers much hospitality all year round. In the fall, olives and grapes are harvested and oil and raki (the local spirit) is made. Child's Highchair available on request. Large selection of satellite TV channels available. Swimming pool with refreshments is located close by. We like this place very much. Even in high season, this was a nice and quitte place close to the sea with several local tavernas ang good food. There is a wonderfull terace to sit, drink wine and look on the sea and mountains surrounding it. It is also very convenient base to explore eastern Creta, but you need a car. An offroad is recomeded to reach empty beaches, remote archeological sites and mountains. However if you like bussy night live and do not like quitte location go somewhere else. Eleanor is very good host. She is easy going and providing us with all we need. Thank you Eleanor for very nice vacation stay. We rented this cottage for two weeks a few years ago. We've often thought of coming back for months - may even do it when we retire. Eleanor is a great hostess and the tavernas and other amenities in Mochlos are wonderful, without distracting from the restful atmosphere. Une maison simple mais très bien équipée idéalement située pour des vacances calmes avéc un cadre magnifique Un accueil très chaleureux À recommander! Sehr schöne Lage mit Aussicht aufs Meer. Mochlos ist idyllisch und bietet Einkehrmöglichkeiten. Wir haben 1 Woche in der Villa Nummer 3 verbracht. Sie liegt einfach genial. Mochlos ist ein wunderbares kleines Dorf das wahnsinnig viel Charme hat. Von unserer großzügigen Terrasse aus hatten wir einen fantastischen Blick auf das Meer. Die Unterkunft an sich ist etwas in die Jahre gekommen. Es ist alles da was man braucht aber in keinem sehr guten Zustand. Die Einrichtungsgegenstände und Gartenmöbel sind leider schon etwas abgewohnt. Die Unterkunft war aber tadellos sauber und die Vermieter sehr nett. Wer also keine 5 Sterne Luxusbude erwartet, auf harten Matratzen gut schlafen kann und dem einfach die Lage wichtig ist, ist hier richtig. Hier ist absolute Entschleunigungsgarantie und Ruhe gegeben und die Einwohner von Mochlos sind unglaublich freundlich. Mochlos is a small fishing village with several taverns and several small shops. Remains of a Bronze age town are visible on the island opposite the town. In the sea near the village, fish tanks dating to the Roman era are visible. During the summer months, archaeologists conduct an excavation on the island, providing more information on the local history, which goes back almost continuously for over 4000 years! Special celebrations are held at Easter and you are welcome to participate. Olives and grapes are harvested in the fall, and then the production of oil and raki, the locally manufactured liquor, begins. Be sure to sample the oil, the raki, and don't forget the local red wine! Other Activities: Diving is available at a nearby hotel (25 min. away) and golf is available at the new course near Hersonissos (40 min away). Rates include towels and sheets and final cleaning. We keep the same prices from 2009 to help fight the economic crisis. A 1/4 deposit is required to reserve the property.